"This is a response from Pertamina following the extraordinary incident in Agats District of Asmat District which caused the death of 59 children. Noted, outbreaks of measles and malnutrition occurred in Nakai Island's third district of Pulau Tiga and Kota Agats"
Jayapura (Antaranews Papua) - The management of PT Pertamina (Persero) Marketing Operation Region (MOR) VIII Maluku-Papua sent aid to Asmat District, Papua Province, to help people affected by the epidemic of measles and malnutrition. General Manager of Pertamina MOR VIII, Tengku Fernanda, in Jayapura on Tuesday, revealed the assistance in the form of supplementary food and nutritional supplements for toddlers, submitted to the Integrated Task Force chaired by the Papua Police Chief Irjen Pol. Boy Rafli Amar. "This is a response from Pertamina following the extraordinary incident in Agats District of Asmat District, which caused 59 children to die, and this measles and malnutrition outbreak occurred in the Nakai District of Pulau Tiga and Kota Agats (Department of Health data of January 2018)," he said. According to him, Pertamina will continue to follow the progress of the handling of the outbreak and did not rule out his side re-channel assistance as needed. 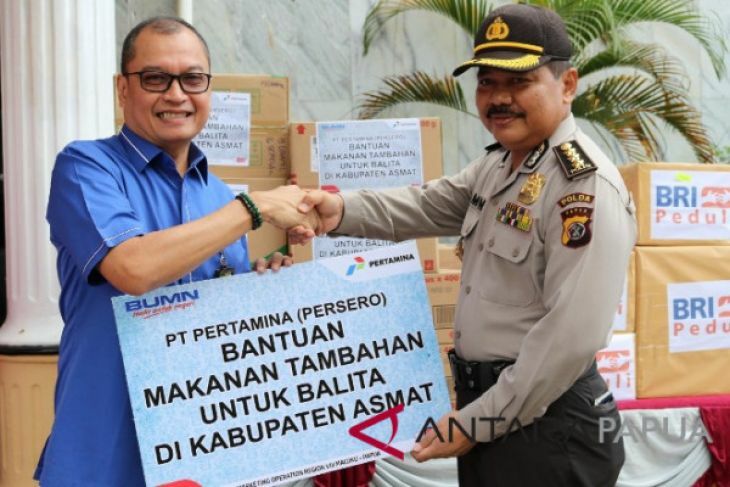 "Pertamina's first phase of assistance is in the form of food and milk for toddlers in accordance with the current urgent needs, and Pertamina will again send additional assistance to overcome the Measles and Malnutrition outbreak in Asmat District," he said. Fernanda stressed the importance of health issues and the improvement of health services for the community through Pertamina's CSR (social awareness) programs.